In today’s Gospel (John 1:35-42), Jesus calls His first three disciples. And it is an astounding event. What would cause three men to be so impressed that they would leave their lives behind and follow some Rabbi they just met? 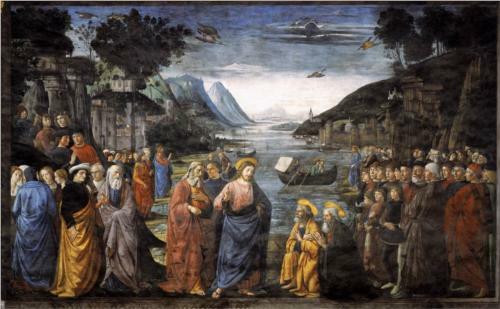 John the Baptist is standing with two disciples (Andrew, and presumably John the Evangelist), sees Jesus walking by and says, “Behold the Lamb of God’. As we discussed in yesterday’s post, “Lamb of God” is rich in meaning, but also mysterious. Evidently, John the Baptist knew what he was doing, for his two disciples immediately followed Jesus. When Jesus asks, “What are you looking for?” they respond, “Rabbi, where are you staying?” – This is a tremendous acknowledgement because: 1) They immediately call Jesus “Rabbi”, an exhaled Jewish title and one not given lightly (it took years and years of study to become a Rabbi) and 2) They intend to follow Jesus; “where are you staying” implies that they intend to become followers of this Jesus. Jesus offers an invitation and they follow Jesus and are with Him until 4 that afternoon. After just a short time, Andrew seeks out his brother Simon and says, “We have found the Messiah”. This is incredible! The Jews had been waiting for the Messiah (The anointed one of God) for centuries…and yet, after just a few hours, Andrew definitely proclaims that Jesus is the Messiah! Amazing! Peter is “brought” to Jesus and Jesus gives him a new name (Cephas which means ‘rock’ in Aramaic, Greek for ‘Peter’; this is a new kind of name, “Rock” was not a regular name at the time). This is remarkable, for when a new name is given to someone in the Bible is is an auspicious occasion of God’s outworking in the world (Abram is renamed Abraham; Jacob is renamed Israel). We are left to wonder, what is it about Jesus Christ that is so impressive that men would leave everything on a short meeting with Him? What is it that they knew, that perhaps we don’t?